We’ve been exploring the different phases of man’s relationship to work—work in the sense of job, labor, or vocation. Man has had varying relationships to work from creation, to work after the fall, to work in light of the gospel of Jesus Christ. In the last installment of this series we began to look at how the gospel changes our view of work. Particularly, we were concerned with whether the gospel rules out any kind of focus on work productivity altogether. Which is why in part 1 of productivity and the gospel, we asked if a Christian focus on productivity in our work is anti-gospel, or is it legalistic? We saw then, that certainly we can be legalistic in how we approach our work. If we try to rely on our good works for salvation or seek to impose extra-biblical requirements on others as concerns work and productivity. But far from being antithetical to the gospel, work naturally follows in the life of a believer saved by grace (Ephesians 2:8–10). 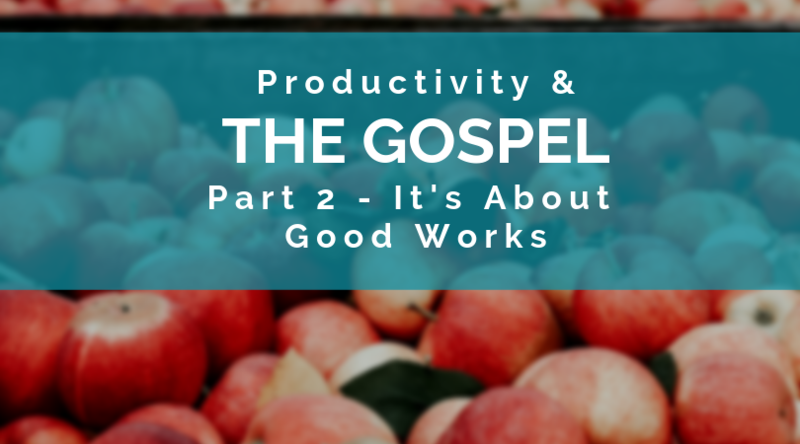 But there’s still more to be said about how work and productivity relate to the gospel. Particularly, we still need to allow the gospel to change our definition of work. In this post, I want to direct our attention to the content of Christian productivity. What exactly is it we are called to be productive in? Is it merely that we are supposed to be doing our jobs better, being better Christian spouses, or increasing the regularity of our church attendance and giving? Is some work more spiritual than other work? And where does the concept of “good works” fit into all this talk about fruit-bearing and productivity in our labors? I believe that most Christians have far too narrow a definition of good works. So, here I am going to try to demonstrate that Christians should have as their goal that all of their work would eventually become coextensive with their “good works”. I will posit that the primary change the gospel produces in the Christian’s relationship to work is that he is now made able to be productive in good works, and that good works are now to be the goal of all of a believer’s work. What exactly is that fruit? By instructing us to be fruitful, Jesus was referring to Christian good works. We can make this claim because in John 15, the fruit which Christ is talking about Christians bearing—this fruit we are to be productive in bearing—is clearly not just any work, but good works specifically. This is made evident by what follows Jesus’ lesson on the vine and the branches. He immediately begins talking about obedience to His commands (15:12). He even writes, “You are my friends if you do what I command you.” (15:14). The fruit which we are to be bearing is our acts of obedience unto God. So, the context makes it clear that in Jesus’ economy fruit-bearing equals good works. The apostle Paul also makes this connection between bearing fruit and good works explicit in Colossians 1:10. “so as to walk in a manner worthy of the Lord, fully pleasing to him, bearing fruit in every good work and increasing in the knowledge of God.” And in Philippians 1:11 he again talks about good works as “the fruit of righteousness.” This is all made possible, of course, by our being united to the true vine. Without being joined to Christ we are unable to bear fruit—we “can do nothing” (John 15:4, 5). So, to take it a step further, if fruit is good works, what exactly are good works? A simple working definition might be: a good work (or fruit) is any act of obedience to God’s standard, performed in faith as an act of worship to Him. Good works, therefore, are works because they are actions which are performed. They are good because they adhere to God’s standards—which is to say, they are expressions of obedience to the commands of Scripture and those things which comport with His moral law and character. Or to bring it back to what we talked about at the beginning of this series, when we behave like accurate image bearers of God (Gen 1:26–27), we do good, because God is good. If you want an example of this, simply look to Christ, who is the example of a life of truly good works. Now, I said at the start of this post that I want to show that all Christian work is to be composed of good works. You might argue here that there is a difference between work as we’ve talked about in previous posts about productivity (i.e. job, career, 9–5, etc. ), and good works. But not so fast! All of life, everything we do, should consist of good works—obedience performed in faith. Romans 14:23 says “whatever does not proceed from faith is sin.” So, there should be no divide between our work and our good works. We can either do our work in faith-filled obedience to Christ, or we can sin. There is no in-between. Once we recognize that our present work is valuable not simply by virtue of the specific job itself, but by its capacity to be a conduit for performing good work unto God’s glory, it adds meaningfulness and eternal value to even the most mundane of tasks. There are more efficient ways to build a barn. One of the unfortunate side-effects of our modern focus on efficiency in work is that we have set as our goal doing the least amount of work possible. This implicitly denigrates the good of Christian work as a channel for Christian good works which are pleasing unto God. Work is not an obstacle to be avoided but an opportunity to be embraced in our efforts to glorify Christ. Many Christians have far too narrow a conception of what makes something a good work. So, we evaluate certain vocations as more spiritual than others. If I asked, “think of a job where you get to do good works for a living,” you might mention pastor, missionary, or charity worker. But when you think of jobs that do good works for a living, you probably wouldn’t immediately think of bank tellers or journalists, and you certainly wouldn’t think of lawyers. But, since good works, or fruit in the John 15 sense, are simply acts of obedience rendered in faith, there is no moment and no work in which we cannot be being productive in good works. Cleaning toilets, mowing the lawn, even taking a deposition—all of these are opportunities for Christians to bear fruit in Christ’s power for the Father’s glory. The most meaningful part of your job, then, isn’t what your job is, but how you do it. And most importantly, Who you do it unto. The gospel rescues work from an insignificant, laborious necessity and transform it into a glorious means of bearing fruit for the Master. Write this down, tape it to your steering wheel, so that every day on your commute to work you are reminded of this incredible privilege and command, “Whatever you do, work heartily, as for the Lord and not for men, knowing that from the Lord you will receive the inheritance as your reward. You are serving the Lord Christ.” (Colossians 3:23–24). As one united to the true vine, your life is to be marked by abundant fruitfulness. This fruitfulness should be seen in every aspect of your life, even your work. So, the life of a productive Christian most certainly concerns work, and all of our work should be good works. If you’re anything like me, you never get jealous at the success of other ministry leaders. You are always content with the realm of ministry God has allotted you and have no desire to attain the reach and influence of the megalomaniac megachurch pastor down the street.